Frasers Property has fast-tracked its new release at Putney Hill, Canopy, following record sales and unprecedented interest over the past month from buyers eager to get their hands on a slice of the premium master-planned community. 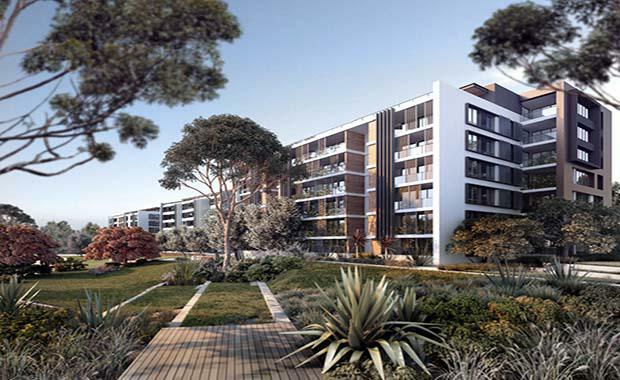 Canopy, the first residential apartments released in Putney Hill’s Morrison Precinct, is located west of the new community’s 2.4-hectare parkland, Lardelli Park. Canopy will feature 131 apartments in three boutique buildings: East, West and Central. The launch of Canopy follows the hugely successful sell-out of Putney Hill’s Reserve houses, which were snapped up by buyers within a few weeks. Frasers Property Sales Director Paul Lowe predicts that the release of Canopy will be met with enthusiasm by buyers eager to secure their own piece of the flourishing community. “Canopy is a unique chance for buyers looking for a compelling opportunity to purchase a high-quality product off-the-plan within an already established thriving community that is Putney Hill,” said Mr Lowe. The apartment buildings will be a mix of one, two and three bedroom apartments, with ground floor courtyards and oversized penthouse terraces, set amongst the buildings’ lush landscaping surroundings. Cox Richardson Architects designed apartment have a north facing aspect surrounded by parkland and stunning landscape designs, will be priced from $600,000. Each apartment with premium quality finishings including Smeg appliances and Parisi fixtures, thick stone bench tops, and integrated fridge space. Canopy will feature secure basement parking and storage. Redefining the new Australian neighbourhood, every aspect of Canopy has been designed to promote a healthy lifestyle for future residents. Fitness amenities include Putney Hill’s own three kilometre scenic running track, three fitness breakout areas, and the adjacent Royal Rehab Recreation Circle facilities of tennis and basketball courts, community green and children’s playground. “We recognise that buyers today have more expectations around the amenities on offer when considering a home. We also understand that wellbeing is becoming an increasingly important consideration where families, young professionals and empty nesters are choosing to live,” said Mr Lowe. Putney Hill is a hugely popular thriving neighbourhood of approximately 700 houses and apartments, together with parklands, community gardens, native trees and bushland. More than 250 people have already taken up residence at the community, with construction for Canopy forecast to begin in mid-2015.